← Book Launch for Isis, Vampires and Ghosts – Oh My! I’m on tour with Isis, Vampires and Ghosts – Oh My! What I have been doing this week is a virtual book tour with Bewitching Book Tours, and I’m loving it! I highly recommend any emerging Author wanting to get their books noticed (whether paper or an eBook) to invest in a virtual book tour. 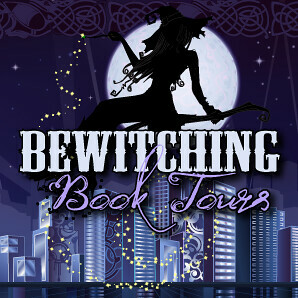 And I highly recommend Roxanne at Bewitching Book Tours if you’re writing in the paranormal or urban fantasy genre. Yes I know a virtual book tour doesn’t physically take you anywhere and it’s not as glamorous as being able to swan in and out of a book store smiling for pics and signing autographs… but let’s face it fellow emerging Authors – that isn’t going to happen for the majority of us, no matter how good our books are. Don’t poo poo the virtual book tour as it is a fantastic way to get exposure to your work. Throw in a give-away to entice the readers and you can double your following of fans on social media. Now you have their attention though, it is up to you to keep it. The tour has done its magic and it’s now time to do your own. As for me, what am I doing on my tour? Well, below you will find my schedule. I technically should have blogged about this last Monday when it started but my sharing and caring hordes have passed on a couple of different winter bugs to me and so I’m a little behind in my asset shaking. Still, the links to where I’ve already been are still valid so please feel free to go check them out. Not just for my work but for the other awesome Authors out there shaking their assets just as hard. 3 Partners in Shopping, Nana, Mommy,Sissy. Too! **Please note: I have been having difficulties with WordPress actually REMEMBERING the links in the list. I have added them repeatedly and they work… and then they stop working. It is a WordPress fault. So if a link is not working, please just copy it and paste it into a new browsing window. Sorry about this, but as said – this is a WordPress fault. There you have it, my virtual book tour. I hope to see you around the sites and there is always the option for you to come and say hi to me on my Author page on Facebook or to tweet me on Twitter. I’ve really enjoyed the interviews and blog posts I’ve done so far and I send out a big thanks to Roxanne and all the people who opted in to host me on this tour. You are all awesome and emerging Authors appreciate your help… well, this one does anyway. Thank You! Tags: advice, being a writer, being an author, eBooks, emerging author, fiction, Hague Publishing, Isis, new ebook, Paranormal, Vampires, Vampires and Ghosts - Oh My!